You think it's all right to eat food off the floor? Or are you one of those whose modern fear of all vermin renders the idea sickening? For a long time, people have been given to understand that it is scientifically kosher to retrieve “fallen” food provided it was not in contact with the floor for more than five seconds. Now a new study questions this thumb-rule, claiming that if the food is moist, such as buttered toast, harmful bacteria can latch on it within a second. The study, authored by Donald Schaffner, professor at Rutgers University, did not investigate whether eating floor-kissed foods actually makes people sick. For, to be sure, many with a slightly relaxed sense of hygiene indulge in this risky behaviour, which may or may not result in illness. Nonetheless, it does suggest that as a general rule you are safer trashing the dropped bits, no matter how temptingly delicious. This should most likely apply to adults but should kids too follow this prescription? Curiously enough no, if you put your bets on the hygiene hypothesis, which suggests that the decline in infectious diseases in the West through better hygiene and sani tation, which inevitably led to a mass purging of microbes from human habitats, is probably behind the almost parallel rise in new and mostly urban afflictions such as allergies and autoimmune diseases. First proposed in 1989 by a British epidemiologist, David Strachan, the basic idea behind the hypothesis is simple. The immune system of babies yet to see the light of the day is weak, protected as they are by the mother’s bodyguards. To protect their immune systems from the dangers of an alien world, babies once delivered must be allowed to bathe in the natural shower of germs, proponents believe. This boosts immunity, they claim, even though they are not sure how. More recent versions suggest there are two kinds of bodyguards. If one of them is not trained well, the other becomes over-sensitive, thus causing allergic or autoimmune reactions. The hypothesis seemed counter-intuitive when it was proposed the first time, but over the past two decades it has gained currency thanks to studies backing its premise. Epidemiologists have shown that children reared in the country, and hence less clean surroundings, are far less prone to allergies and autoimmune glitches than their urban cousins. An oftquoted study found that children brought up in dirtier East Germany were ironically much less vulnerable to allergies and asthma than children growing up in sanitised West Germany. Studies have found similar associations between the developing and the developed world. In the past two years, immunologists have also unravelled a few nuts and bolts underpinning the hypothesis. Last month a Technical University of Munich study on mice proposed that “if it is possible to encourage harmless bacteria to colonise the intestines, this would also reduce the body’s reaction to allergens”. Another study by the Pasteur Institute in France demonstrates how microbes sabotage immune cells imp licated in allergic reactions. The hypothesis is a work-in-progress, but as the body of evidence grows, it is bound to attract more adherents. At any rate, it has already captured popular imagi nation. The growing aversion to vaccination, antibiotics and C-section, all of which impoverish the baby of its microbial heirloom, point to the growing appeal of the hypothesis. Some mothers, who for some reason cannot deliver naturally, even want their babies smeared with their vaginal fluids! A new book, Let them eat dirt, argues against fetishising cleanliness when it comes to parenting. Even so, this presents a frustrating dilemma—protecting versus exposing—for parents sympathetic to this radical notion. Rejecting vaccines and antibiotics might be tricky, but they can at least allow the kids to wallow in dirt. 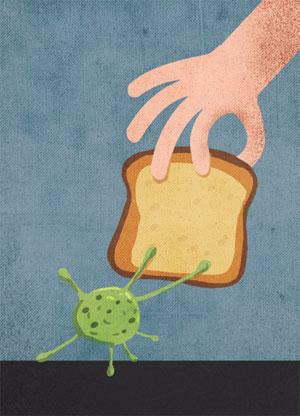 That said, a robust immunity is probably as much about keeping company with microbes as about eating nutritious food, sleeping well, besides much else. As in all things, here too moderation is perhaps the key.